Situated on the east coast of Yorkshire at the mouth of the River Esk, Whitby has an established maritime, mineral and tourist heritage. Its East Cliff is home to the ruins of Whitby Abbey. The fishing port emerged during the Middle Ages and developed important herring and whaling fleets,and was (along with the nearby fishing village of Staithes) where Captain Cook learned seamanship. Its attraction as a tourist destination is enhanced by its proximity to the high ground of the North York Moors Nationall Park, its Heritage coastline and by its association with the horror novel Dracular. Jet and alum were mined locally. Whitby Jet, which was mined by the Romans and Victorians became fashionable during the 19th century. 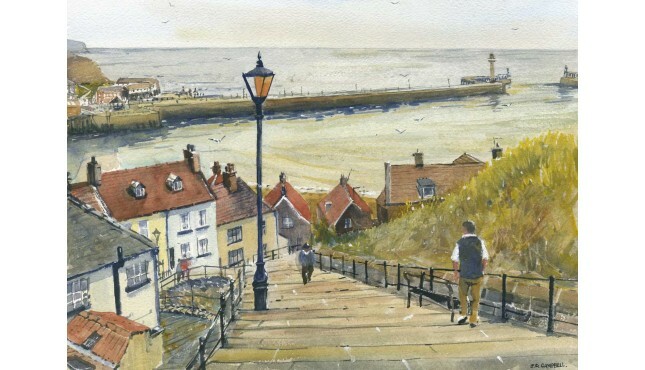 Whitby pictures by some of North Yorkshire's top artistists and photographers are available. The Cod and Lobster Public House is situated right on the seafront of Staithes Harbour. Signed li..
Beautiful light fills a calm Whitby Harbour, as the sun sets in the west.Format: Open editio.. Format: Limited edition Giclee printed on 310 gsm PH neutral fine art archival paper. Optional ..
A glorious sunset to end the day. Sandsend, near to Whitby in the Scarborough district of North Y.. Format: Limited edition Giclee printed on 310 gsm PH neutral fine art archival pa..
Whitby is another of Kate’s favourite places to paint. This print is taken from an original.. Available in two formats Limited edition Giclee print on superior paper with mounting option Pr..
A summertime view of Whitby harbour and Whitby Abbey at sunset Camera used Ebony SW23 6x9 Forma..